“Marco!” called one of the boys in the pool, eyes closed, searching. “Polo!” one of the other boys, eyes open, evading. Calling to find their friend in a game. So summertime, so blue skies and so filled with smiles. “Mom! Seriously. Was that you?” he persists, seeking me for truth. “Yes,” I said, laughing – well, laughing for the next 2 weeks. “Mom,” one of the boys calls, waiting for me to answer, so they know where I am, where to find me. “I’m here,” I answer, knowing that where I am isn’t really important – it is just being with me they are looking for. They’ll follow my answering voice and wind their way to me. Searching me out, just wanting to be where I am. Calling out in order to be with. . . maybe for comfort, maybe for an answer, maybe for encouragement, maybe for a need, maybe just to be . . . with. “God?” I call out, and I listen to locate to just be. . . with. “I’m here,” He answers, and I follow into His presence. I need to call my Father like that, like my boys call to me. Not because I want something. Just because I want to find Him, know He is there or just be with Him. 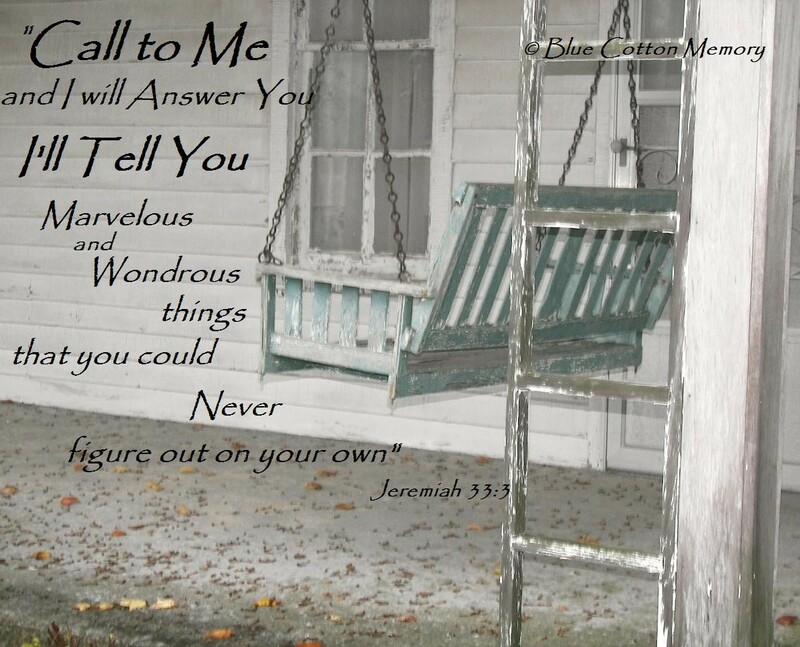 He tells me: “Call to me and I will answer you” (Jeremiah 33: 3a). Like the days I would call to my grandmother from inside the house. “I’m here,” she would call back. I would follow her voice, to fold myself into the porch swing beside her and we would sit, just be, watching the traffic on Main Street, USA, admiring the Magnolia blossoms, talking about a pinch of this, a heap of that. 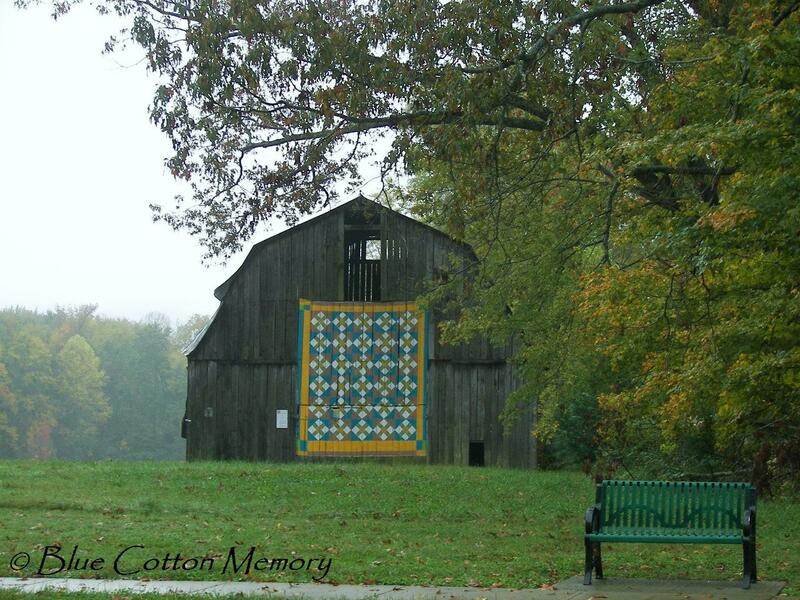 Sometimes, a story slipped out, a piece of history, something special I didn’t know. Being with God is like that, but more. Just the two of us, me not needing anything in particular. Just sitting, listening, talking back and forth – Him more talking, me more listening – or maybe I should say, me trying not to talk as much, learning to listen more. “I’ll tell you marvelous and wondrous things that you could never figure out on your own” (Jeremiah 33:3). I have been missing out, doing all the talking, asking, crying, wobbling. He has things to tell me, if only I would quiet my mind, close my mouth and open my ears – marvelous and wondrous things to tell me. Things I can’t figure out on my own. I think I am ready for that kind of relationship – the just “being” part of a relationship, the ear of the relationship. I want to send a special thanks to my friend Kerry at A Lamp, a Light and a Writer, who posted a Facebook note about learning to be a good listener. You know you’ve only been listening to God with half an ear when you start hearing a message from many different places, turning it into a chorus you just cannot turn off – Kerry was a voice in that chorus encouraging me to become a better listener. Her message wasn’t directed at me – but God spoke to me in that message. Like I told Kerry, I think I am moving out of The Year of Refreshing into The Year of Listening. Stop by and visit her blog. You’ll be blessed. “Being” has been something He has had me focused on this year, too. And listening has been a large part of that. What a lovely post, dear. Filled with Truth and Beauty. What a beautiful post…I am reading from your link on “I Live in an Antbed”. God is so good! And what’s more amazing is that He wants to be with us even more than we long to be with Him! It’s been a while since ive talked to you. just saw that you had posted something, and you always write such good stories. this one was no exception–it is really good. i can hear the chorus too–through many people, many circumstances, many sufferings, many mistakes ive made–He just wants me to listen, to be still with Him, and to let Him gently quiet my mind and give me the peace that I bang my head against the wall searching for–if only i would just listen. i love the way you interweave the relationship with your boys with the relationship with God–beautiful and touching. this quieted me today–thank you. Now you know I’m honest, right? To a fault. This is your BEST post ever. EVER. I am going to copy it off and read it every morning during my devotional time to remind me. Amazing, ML. You need to seriously think about creating a e-book devotional – seriously – of your amazing God posts. Lovely post… I’m learning to listen to Him more too. This goes right along with what I’m hearing… thanks you! There is something so incredibly sweet and honoring about just sitting at the feet of Jesus and listening to His voice. So many times I think what I have to say is so important and then…I realize how much more important His words are. I also need that reassurance that when I call out to God that He is there. I know that I also need to listen more. The last couple days have been really rough and God was so loud when he called back, “I’m here.” I need to be that attentive when he calls. Great post. …..aaahhhh……such peace-giving comfort……..such sweet communion. Thank you for the awesome thoughts here. I enjoyed your prank on your children. 🙂 Listening does help! Learning to be quiet and allow the other person to speak takes discipline at times. Hearing God speak also takes patience to even stop our rote prayer and listen to what the Holy Spirit is telling us. How much do we miss out on when we fail to listen?? We are studying the book of James in church and the pastor spoke abou the verse that says, “quick to hear, slow to speak.” When we quiet ourselves before the Lord there is no limit to what He can and will speak to us. Hi there – wow, I loved this post. You had me all involved with your story with your boys and how true it is that we should be listening more, as you put it – being the ear of the relationship. I like that. I also wanted to say thank you for joining in on my bloghop, winsome wednesday. I really appreciate it and hope you’ll join me there again next Wednesday. I need to do this more often. Share my porch swing with the grandgirl and just be with her. Thoroughly enjoyed this post! Yes, being still and just being in His presence is the most fulfilling thing we can do. Just to bask in love, hope and stillness, at the feet of the Lord…. Blessings! Found you at Faith Barista!